This is plate 3 from 'Sketches in Afghaunistan' by James Atkinson. On their march to Afghanistan the Army of the Indus had opted for the longer southern route round through the Bolan Pass rather than the shorter route through the Khyber Pass. By the spring of 1839 they arrived at the 60-mile long Bolan, which was in the heart of rough terrain controlled by Baluchi chieftains. 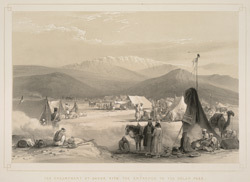 Atkinson shows the troops' encampment at the entrance of the pass, about a mile from the town of Dadhar. He wrote: "On the foreground is Khalik Dad, Belooch, governor of Dadur and his attendant, and some of the wearied camp-followers preparing their scanty meal. As far as the eye can reach from the camp, desolation has marked this arid spot, and the progress to it was a most arduous one; water rarely met with, but in small quantities, and forage equally scarce."